Safely store up to 25 CD, DVD, even Blu-ray discs in this medium-sized cake box with integrated spindle. Clear cover stays in place thanks to the secure twist-lock design. 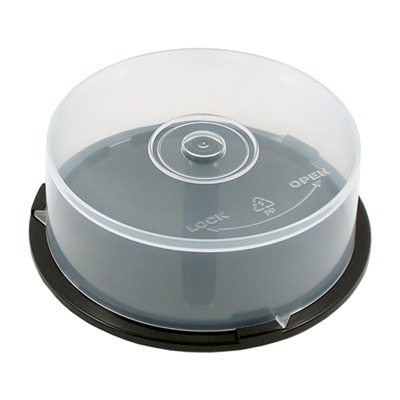 This 25-disc cake box from USDM is great for storing CD, DVD, even Blu-ray discs of any size or capacity. Not only does it protect discs from scratches and dust, but it's stackable with other cake boxes for a convenient disc storage solution. Great storage option, takes up less space than other disc packaging.